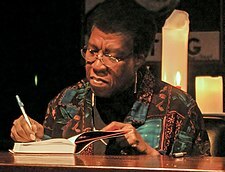 Octavia Estelle Butler (June 22, 1947 – February 24, 2006) je ara Amerika olukowe itan-aroso sayensi. O gba ebun Hugo ati Nebula. Ni 1995, o di olukowe itan aroso sayensi akoko to gba Igbowo MacArthur. ↑ Crossley, Robert (2003). "Critical Essay". Kindred: 25th Anniversary Edition. Boston: Beacon Press. p. 273. Àtunṣe ojúewé yi gbẹ̀yìn wáyé ni ọjọ́ 10 Oṣù Kẹta 2013, ni ago 14:32.